The lightweight Liberty Dining Chair combines comfortable design and clean lines. The aluminium frame is covered with a strong coated polyester sling all-weather fabric. 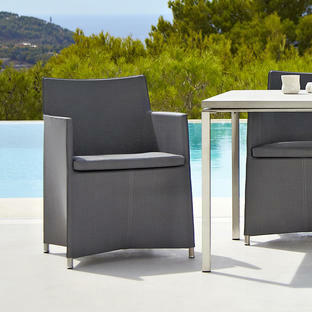 With supportive high backed seat and arm-rests the Liberty Dining Chair by Cane-line is both comfortable and practical. The chair comes with a choice of 2 colours either taupe brown or soft grey. Seat cushion pads in the same colour are included to provide extra comfort. Easy to care for the furniture if left outside all year round can simply be washed down with warm water if required. 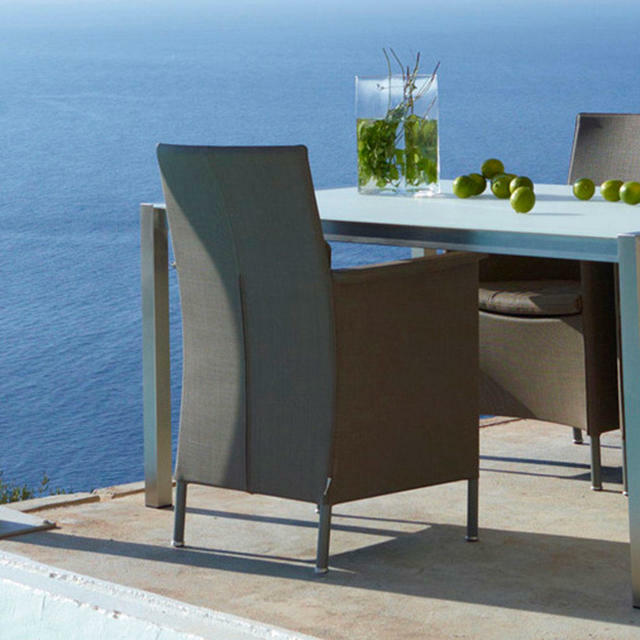 The chairs are ideal when partnered with tables from the Share Aluminium Dining Tables or Share Stainless Steel Dining Table or for more informal dining please see the Core teak topped tables. This product is now discontinued - see here for alternatives. 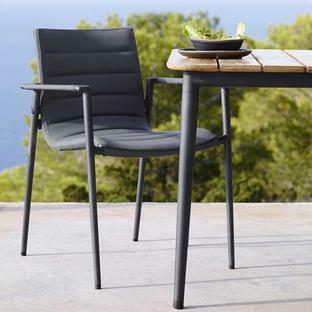 The Liberty Dining Chair is made with grey or brown Cane-line Tex with Sunbrella natté cushions. The Tex fabric is a unique all-weather fabric, which can be used outdoors all year round with a minimum of maintenance.